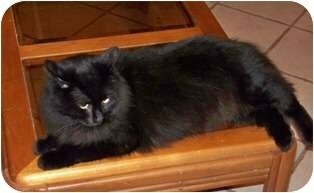 Crow is available in Jackson County, MS.
Crow is a longhaired beauty. Described as friendly and “huggy,” Crow gets along well with dogs, cats, and kids — the perfect family feline. He’s also up to date on his vaccines and neutered. Crow is available for adoption through Jackson County Spay and Neuter in Jackson County, MS.